The content of ePocrates Online is available in an iPhone optimized format at m.epocrates.com. This free, high quality medical resource gives iPhone users access to drug dosing, drug interaction, drug price, and other useful information in the easy to use ePocrates style through wireless internet access. ePocrates for PDAs is well known to health care professionals, with over 500,000 active users, including one in four physicians, in the United States. The only drawback of ePocrates Online is that wireless web access is required to access the content on an iPhone. 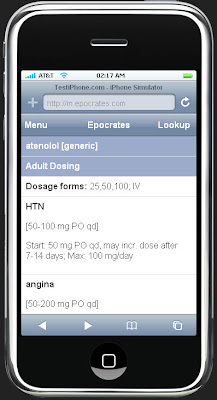 ePocrates has announced plans for a version that can be downloaded to your iPhone for 2008.
iPhone native ePocrates will make the iPhone a more viable medical smartphone. I would not even consider switching to an iPhone without ePocrates!